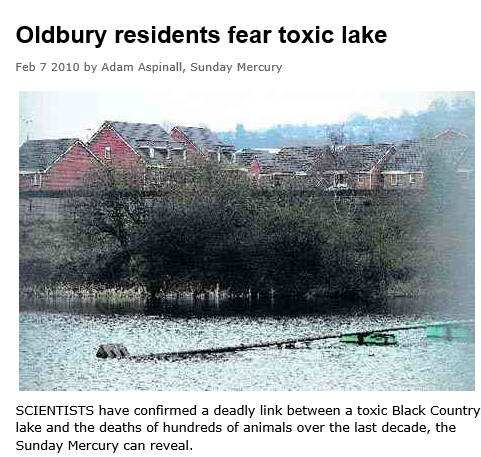 On 7th February 2010, the Birmingham Mail / Sunday Mercury newspaper carried an article about the concerns of Oldbury residents about the dangers posed by Rattlechain lagoon. The article is entitled Oldbury residents fear toxic lake. A question on Yahoo Groups asking for help and information from canal enthusiasts regarding the transport of phosphorus via the canal produced two responses, indicating that not only was phosphorus being carried on the canal, it was also being deposited in the canal, either by accident or design. See the conversation here. April 29th 2001 – The Sunday Mercury carried an article entitled “POISON PROBE AS SWANS DIE IN LAKE“. April 30th 2001 – The Birmingham Post carried an article entitled “Pollution testing at pool over swan deaths riddle“. April 2nd 2008 – The Express & Star carry an article entitled “Worries over toxin in pool“. I particularly like Dudley Bloke’s comment. On 15th June 2009 a parliamentary question was asked by Adrian Bailey MP for West Bromwich West regarding discussions between DEFRA and Rhodia on the future of wildlife on Rattlechain Mere. The answer was not very informative. A second question regarding the percentage of yellow (white) phosphorus in the Rattlechain Mere produced an inconclusive answer. 23rd July 2010 – A nice document by RPS Planning on behalf of Mintworth Transport proposing “quality residential development” on the “Rattlechain site” including the lagoon! There’s a nice photo taken in March 2011 of the new houses and the TOXIC WASTE DUMP available here. May 1st 2012 – an email from Rhodia to Sandwell Council where the Rhodia position on what to do with the Rattlechain lagoon is set out. They seem to agree that the lagoon has been poisoning the visiting birds, though stop short of explicitly blaming white phosphorus that they knew to be there all along since we first reported bird deaths on the site. 6th September 2012 – Report to Sandwell Metropolitan Borough Council by Paul Crysell of the Planning Inspectorate, an Inspector appointed by the Secretary of State for Communities and Local Government. This report discusses Sandwell’s Site Allocation plans, and the steps required to make the plan sound and legally compliant. The inclusion of “the Rattlechain site” for housing (including the unremediated lagoon) is not considered a problem at this stage, as long as suitable remediation methods are found and implemented. The discussion starts on page 10, para 40, with the concerns of the Environment Agency. Para 43 suggests that the use of the foundry sand dumped nearby on the “Denver site” could be used to reclaim the site, but p.44 states Rhodia’s objections to this method. The discussion continues up to p.50. The inspector believed that development on the site within the plan of ten years is unlikely. December 26th 2012 – the Express & Star carries an article entitled “Work on contaminated pool in Oldbury ready to start“. 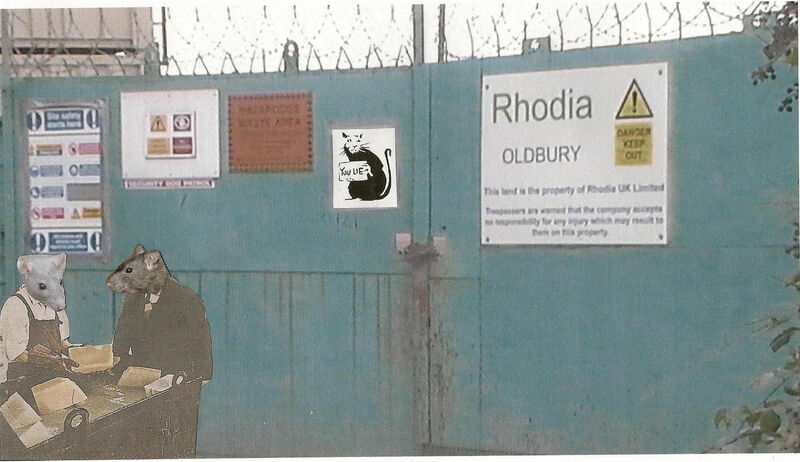 In it ‘Rhodia spokesman John Moorhouse, said: “It is inevitable that a project of this size will be noticed by the local community but we are committed to minimising impact on our neighbours.”’. A bit bloody late if you ask me. It should not be forgotten that Rhodia’s concerns regarding “human health” outside of the lagoon perimeters, came long after their long denials of risk and harm to wildfowl were found to be baseless with direct evidence. When this evidence was obtained, purely as a result of our persistence, they then focused on the human health issue as a means of distracting attention away from their original lies and denials of risk to wildfowl. The risks to humans are more subtle, and even more difficult to prove, which is why they now focus on “protecting wildfowl”- to further distract attention away from those subtle risks. Only time will reveal how these risks manifested themselves, but this relies on “proof” which will almost certainly be denied being tested, as it was for so long with the poisoned wildfowl at the lagoon. Where will those people who claimed it was “safe” all those years be found then?- certainly nowhere near to the toxic waste site known as Rattlechain lagoon.